Microdermabrasion is an ancient treatment that is still around today for good reason – it helps clean pores from dead skin, prevent breakouts and leaves your face feeling healthy and great. There is no downtime associated with microdermabrasion, so it is the perfect treatment to get before going out for the evening. Microdermabrasion is a popular standalone treatment and often our Denver clients request this as an add-on with a facial. 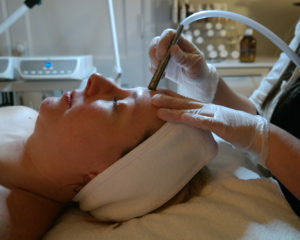 DLS uses the Diamond Wand Microdermabrasion. There are two different wands used during Microdermabrasion treatments – the crystal wand and the diamond wand. The crystal wand was the first available on the market and it came out in the 90’s. This technology shoots crystals onto the face to abrade the skin. Some people would describe it as “sandblasting” the skin. These crystals are then brushed and vacuumed away. While this technique was very effective for its time, it comes with limitations. These limitations include not being able to reach the small crevices on the face, difficulty vacuuming crystals off of the skin, the power of the treatment is controlled by the machine (as opposed to the technician) and some people accidentally ingest crystals. Using a diamond wand is the more modern version of Microdermabrasion. This method is more analogous to sandpaper on the skin versus the sandblasting technique of the crystal wand. The vacuum on the diamond wand is built in so it is a much more sanitary and the power of the wand is controlled by esthetician – not the machine. This control not only means there is less risk of a treatment being too harsh on delicate skin but also that the treatment can be customized depending on the client’s skin care goals. Bonus: The diamond wand is especially helpful for people looking for effective acne treatments! It unclogs the dead skin from pores, prevents breakouts and leaves skin feeling youthful and refreshed. No. In fact, it is very relaxing. Microdermabrasion does include manual extractions, so that portion can feel a bit tender. How long do the results of microdermabrasion last? You will want to have a microdermabrasion treatment every four weeks for best results. What should I expect after my microdermabrasion treatment? There is no downtime with this treatment! Your skin will look great and feel refreshed. It is a great service to get before a fun night out. It is dependent on the cause of the acne. If acne is caused by environmental factors typically three to six treatments will get our clients the desired results. If acne is hereditary it will take more treatments. Are there any side effects with microdermabrasion? Nope. It is probably one of the reasons it is such a popular treatment!